Organic Vapor/Acid Gas and High Efficiency respiratory protection system for welders. Lightweight, compact design. The welding helmet has adjustable head suspension, increased peripheral vision, excellent optical quality and function. Jaco Aerospace and Industrial is your one stop resource for 3M(TM) Adflo(TM) PAPR with 3M(TM) Speedglas(TM) Welding Helmet 9100-Air, 35-3301-20SW, HE+OV/AG, Li Ion Battery, ADF 9100X, 1/C and all of your 3M Products, Tapes, aerospace and industrial needs. SKU Marketplace Product Description: Organic Vapor/Acid Gas and High Efficiency respiratory protection system for welders. Lightweight, compact design. 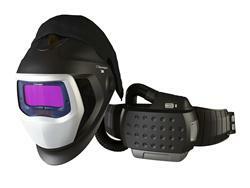 The welding helmet has adjustable head suspension, increased peripheral vision, excellent optical quality and function.